The kids stayed the night at my parents' house last night, so I planned to run as soon as I got up this morning. I wanted to get my run done before 10:00, because I was hoping to stalk Thomas during his second marathon (using live tracking). His marathon started at 7:00 (Pacific time), which was 10:00 for me(Eastern time). I couldn't stand the thought of running the same old routes that I always do around here, so I decided I was going to drive somewhere for a change of scenery. I ended up parking at the high school by the Metropark. Usually, when I park there, I end up running into the Metropark; but today, I chose the opposite direction, just for something different. It didn't seem very windy outside, so I just hoped it stayed that way. I was comfortable in capris and a t-shirt. I ended up getting a late start, but thought I could still be done close to 10:00. Within seconds of the moment I started running on the bike path, I saw a huge group of cyclists coming toward me. I never see that many people on the path, even spread out through the whole route, let alone in a pack. We exchanged "Good morning"'s as we passed each other, and I kept running. And the bikes kept coming. I noticed that they had numbers pinned to their backs, so I assumed it was some sort of race or cycling club or something. (I later did a google search, and discovered it was the Metro Grand Spring Tour put on by the Downriver Cycling Club.) Seeing the cyclists made the time go by so fast--there were probably about 120 of them total? It also made my pace a little too fast! I'm supposed to do my long runs at a 9:53/mile pace, and I was definitely going faster than that. 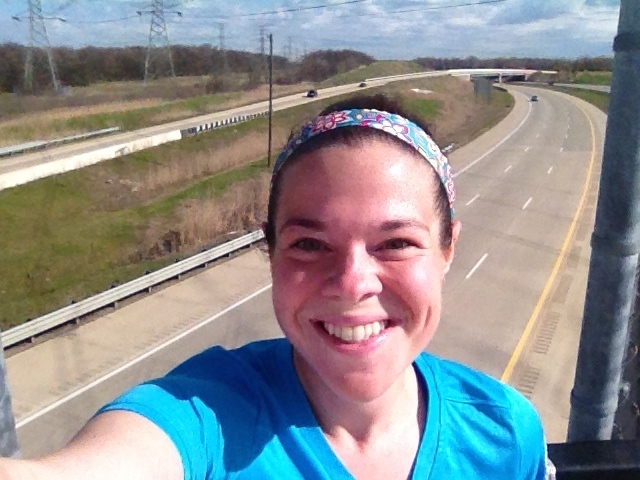 In the second mile, I had to run on an overpass, which, to me, felt like a mountain. I'm not used to hills! I did an out-and-back route, so I had to do the overpass twice. I like this route, because there is a little bit of everything to see. I went over the overpass, and then through the woods, and then along a pretty busy road. Once I saw the first couple of splits were 9:16 and 9:15, I decided to try and keep my pace under 9:30. But each mile, I ended up doing a bit faster than that. I started to do the math in my head, to see if I could finish my run before Thomas started his marathon at 10:00 (EST). It would be close, but it would be a fun challenge to try. 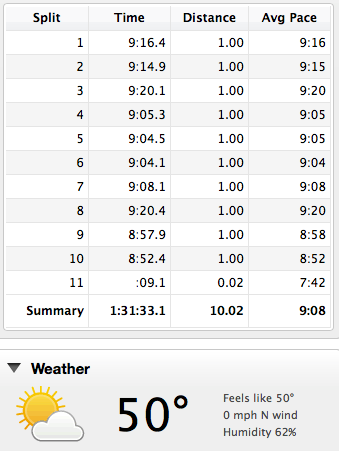 I was almost expecting to crash, especially when I saw splits of 9:05 and 9:06. But I kept on running, and seeing the cyclists pass was making the mileage fly by. A couple of the cyclists were looking at a map, at an intersection, and they were really confused about which way to go. So I helped them figure it out, and then I was only a mile from my car. I finished with a 9:08 pace, which (if I were running a half-marathon) would have been a sub-2:00 finish time. I feel really good about that! I feel more confident that I could probably pull off a sub-2:00 if I wanted (NOT for the Heartbreak Hill Half, though--I'll be lucky if I hit 2:15 for that one!). I was super thirsty, and a diet root beer sounded SO good (there is an A&W near where I parked). There were too many cyclists along the road for me to turn into the A&W (safely, anyway), so I just drove home, skipping the root beer. My legs felt a little bit sore, so I am definitely going to take it very easy on tomorrow's run. This afternoon, I went to a fundraiser for my friend Sarah's children. She's the one who died from melanoma in March. There was a craft show/bake sale/raffle today, and the proceeds would go to her kids. I went with Noah and Eli, and we bought a bunch of raffle tickets. The kids loved choosing where to place their tickets--hopefully, they win something! The fundraiser seemed to have a great turnout, so I'm happy that Sarah's kids will benefit from it. Can you have sherbert? It's very refreshing and non fat. What about fresh cold fruit, that might take the edge off. I consider sherbet a dessert, so I won't eat that... but the fruit definitely helps! Last year you ate a ton of grapes. Have you thought about eating them again to help you when you're craving something sweet? So excited for you that you still haven't had sweets! I gave up my sweets ban after I was sick and had an infected tooth this week. I'll get back to it though. I love reading about your experience with it. It inspires me to get back on track soon! Katie, your May challenge has inspired me. A few weeks ago I went a week without dessert (the same idea, no sweets but it was okay to eat foods with sugar such as some whole grain breads) and it was so tough! I have such a sweet tooth. I am goin to commit to this as well until the end of May. Yikes, it'll be a lot of fruit and sweet potatos this month! Good luck resisting the cravings, Katie (and everyone else!). I've also given up sweet stuff for May, and had bad chocolate cravings this weekend. Though I did manage to resist, hooray! I second the other comment posters' recommendations of fruit and sweet potato. I think I might make some jelly (Jello equivalent) using fruit juice and gelatine for a fruity, no added sugar dessert... And one recipe I tried out over the weekend was for mascarpone with cherries and toasted almonds. It was v good (and easy)! I LOVE when something happens (like the cyclists) that take my mind off running....I seem to have great runs when I take my mind off of myself! I wish I hd places like you have to run! I have to give you credit, I could not give up sugar and sweets for a whole month. I would rather have a little than to give them up all together. This is a real test of your self discipline! Hey Katie! Good job with your sweets challenge- I gave up sweets for Lent, and it's hard but definitely doable! Here are a couple of recipes I love when I'm craving something sweet- a green smoothies (http://fabfitchicago.com/2014/02/13/healthy-eats-hulk-smoothie/) and avocado chocolate pudding (http://fabfitchicago.com/2014/03/06/craving-buster-avocado-chocolate-pudding/). Good lucky! nice run! Sweets are certainly my downfall too...what are you giving them up for the month of May? that sounds like a fun (and riduclously hard) challenge! What will be your first treat when you are done?! I really like to challenge myself once in a while, just to have a goal to focus on that doesn't involve weight or running ;) Giving up sweets for a month is VERY tough, but I'd like to see if I can do it! My first treat when I'm done will probably be ice cream... I've been craving it so badly!